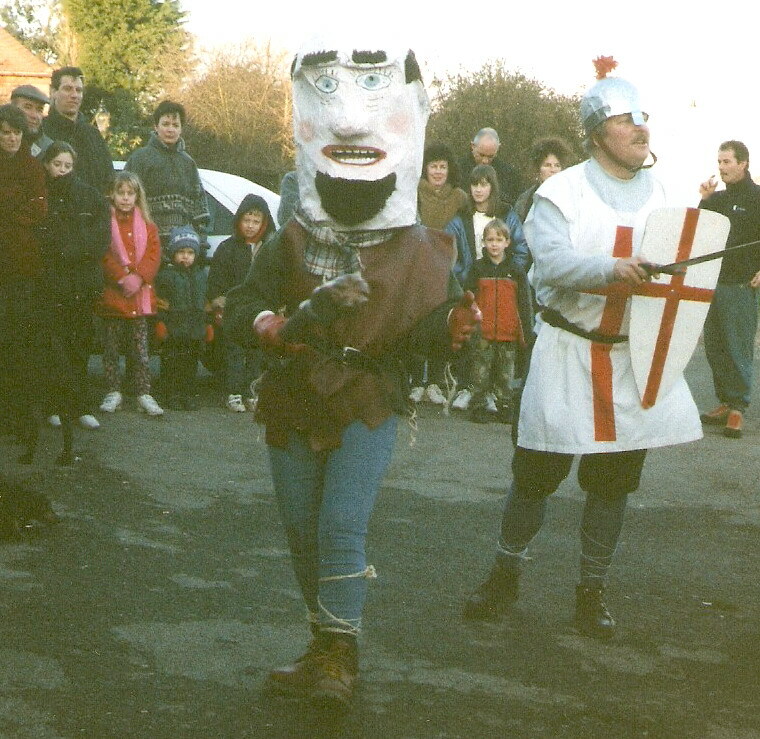 The custom of ‘Mummering’ or The Mummers’ Play has a long tradition over several centuries but its origins are mixed and varied and the story line can take many forms. 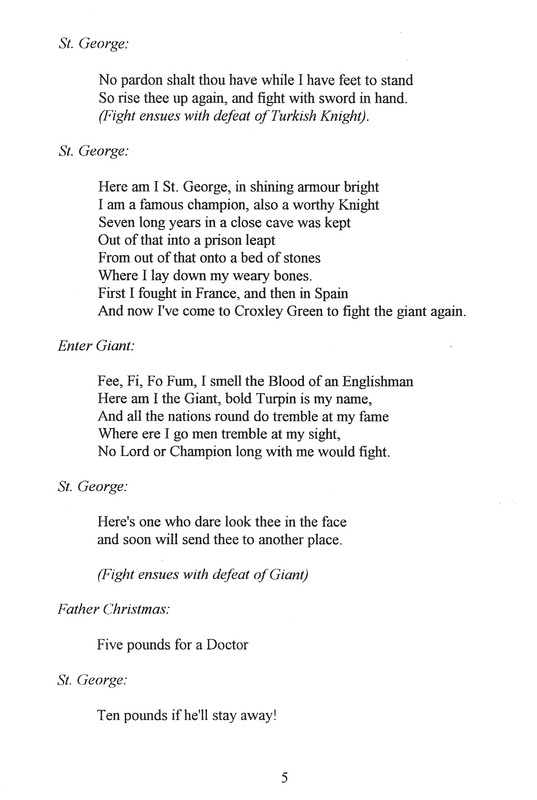 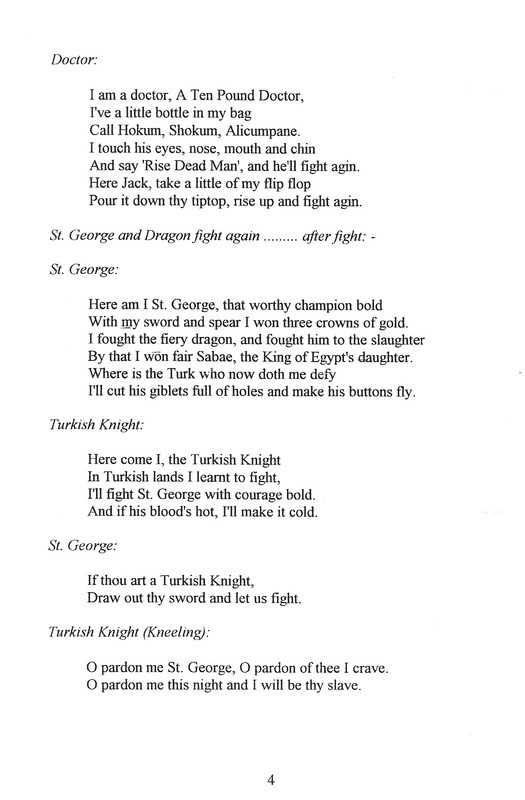 The play itself is loosely based around the hero, St George. 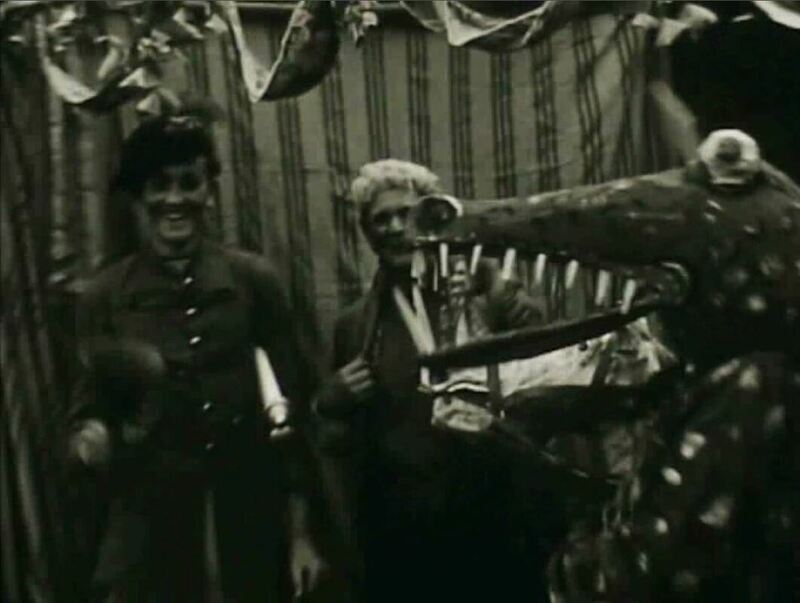 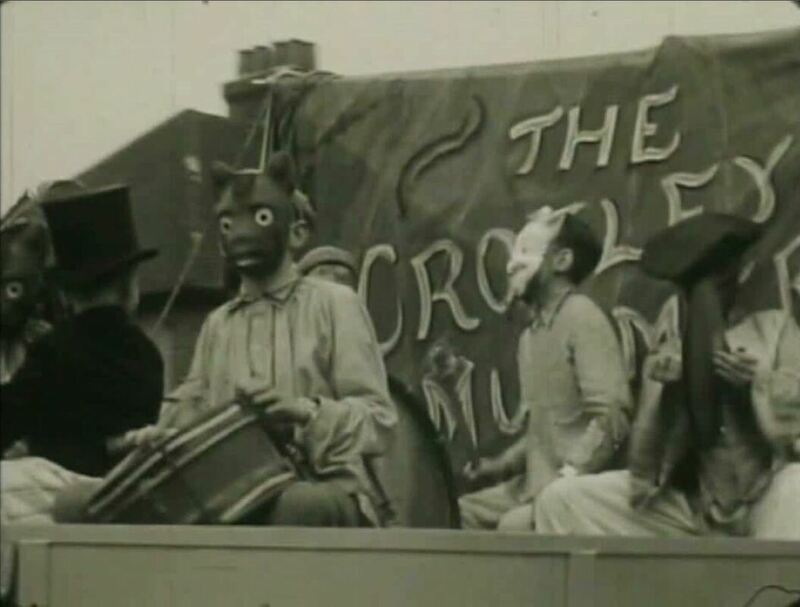 Shortly after the First World War, Neggy Wilson (the Old Boys School headmaster), decided to gather together a Mummers’ Troupe in Croxley Green. 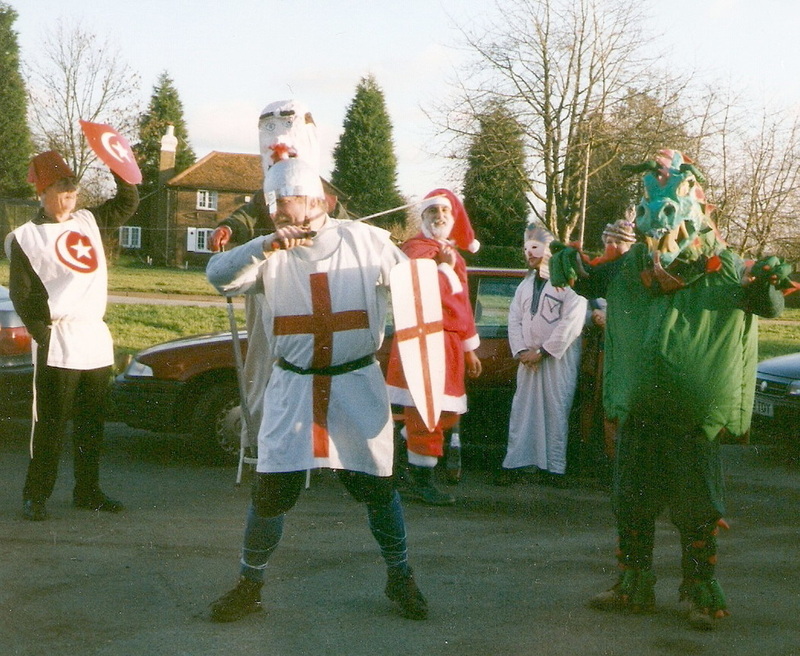 He invited ex school boys who had shown an interest in the school’s annual Christmas Concert to become members. 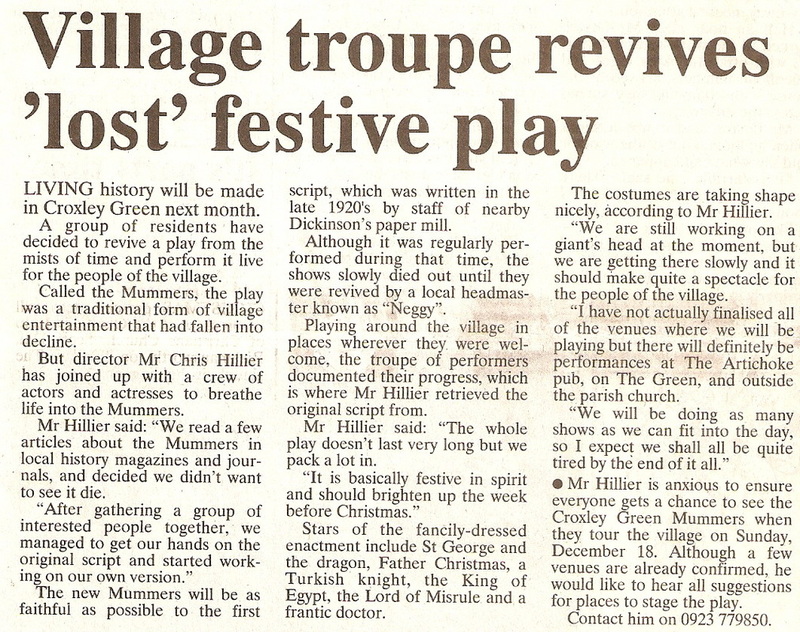 He created a version of the play for the village, adapted from many accounts of those used around the country. 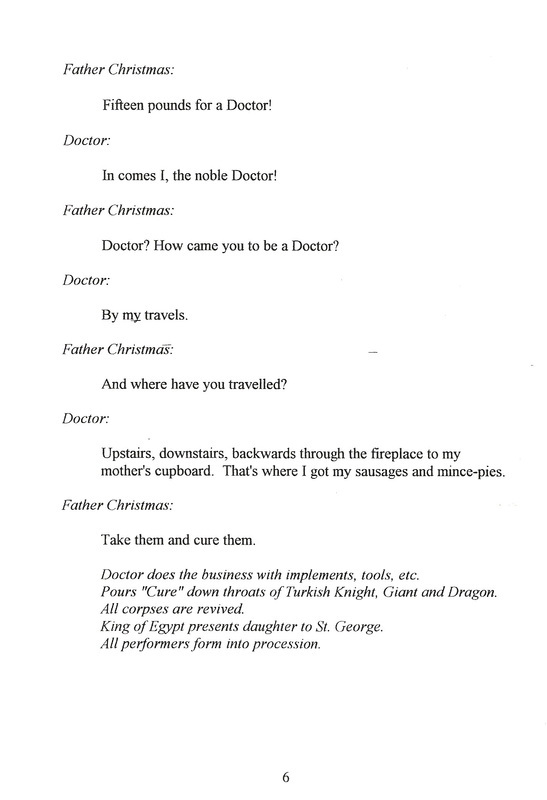 The play can comprise countless unusual characters but Neggy’s play consisted of St. George, The Dragon, The Turkish Knight, The Doctor, Father Christmas, The King of Egypt and his daughter, The Giant and The Lord of Misrule. 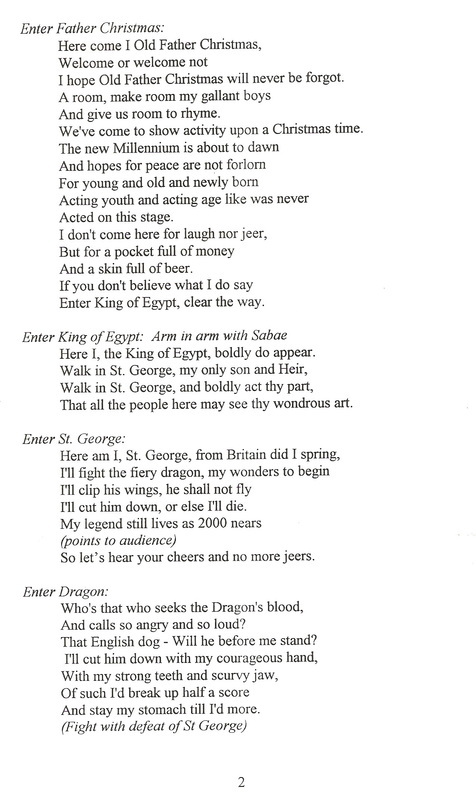 All the versions of the play tell a similar story of the hero, St George who is killed by the Dragon. 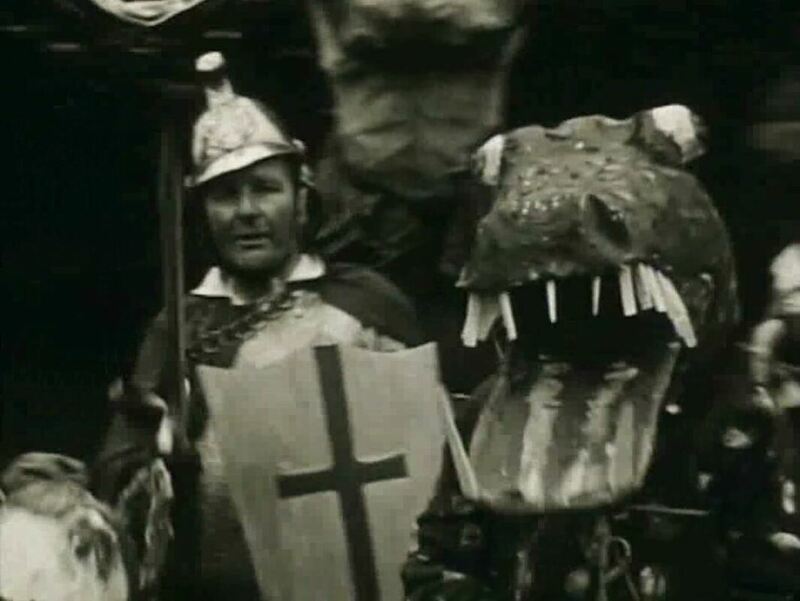 After being revived by the Doctor, St George defeats the Dragon, the Turkish Knight, and finally the Giant. 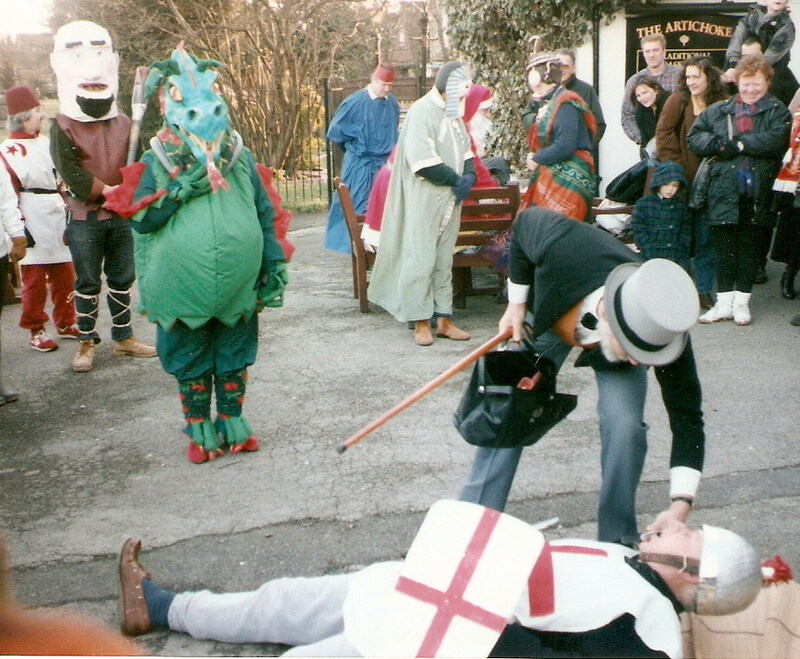 The action concludes with St George winning the hand of the King of Egypt’s daughter and the Doctor using his magic potion to revive those slain by St George. 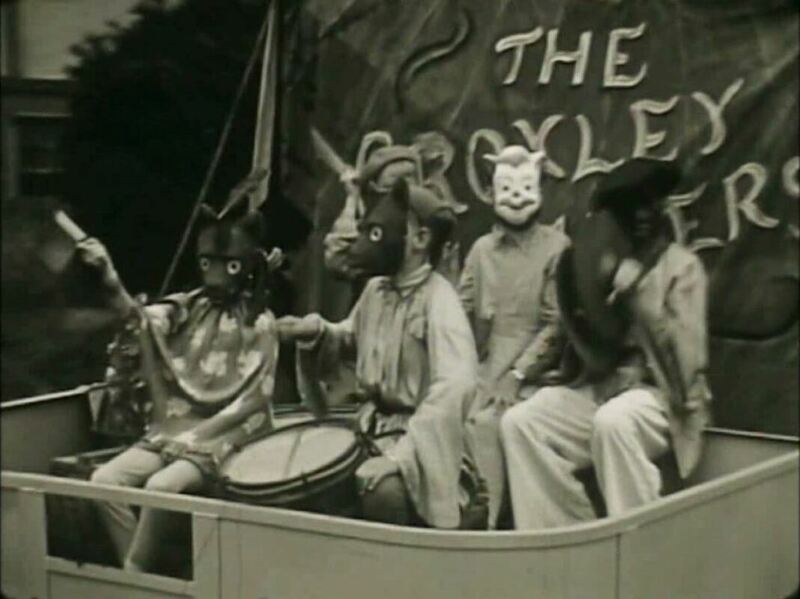 Early performers included Stan Lyons, Fred Randall, the brothers Jim, George and Bill Samuels and Frank Paddick. 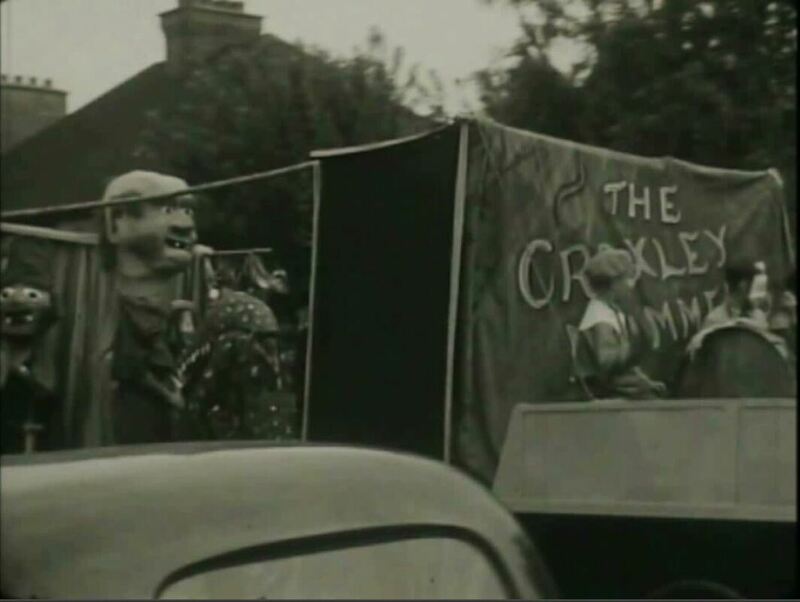 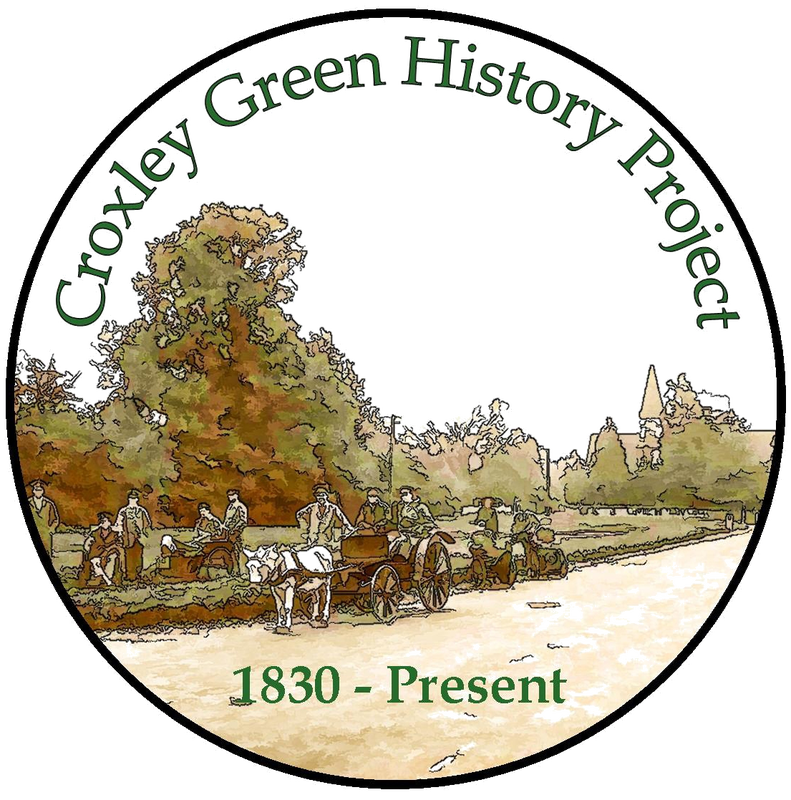 Other cast members included Bert Sadler, Albert Seabrook, Don Webb, Felix Walsh, Paddy Moohan, W Samuels, Jack Tandy, Peter Samuel, A E Warn and John and Michael Thomas, all of them well known Croxley Green names. 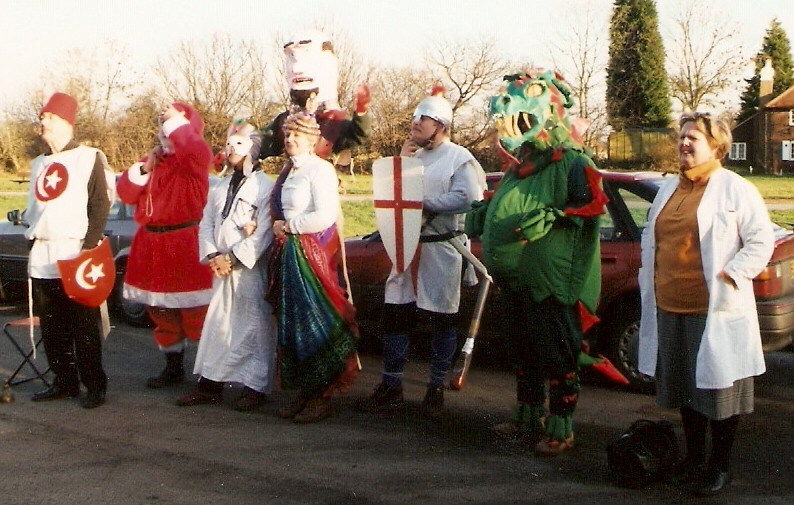 It soon became the tradition for this imaginative group to be asked to perform the play yearly on Christmas Eve as well as giving other special performances. 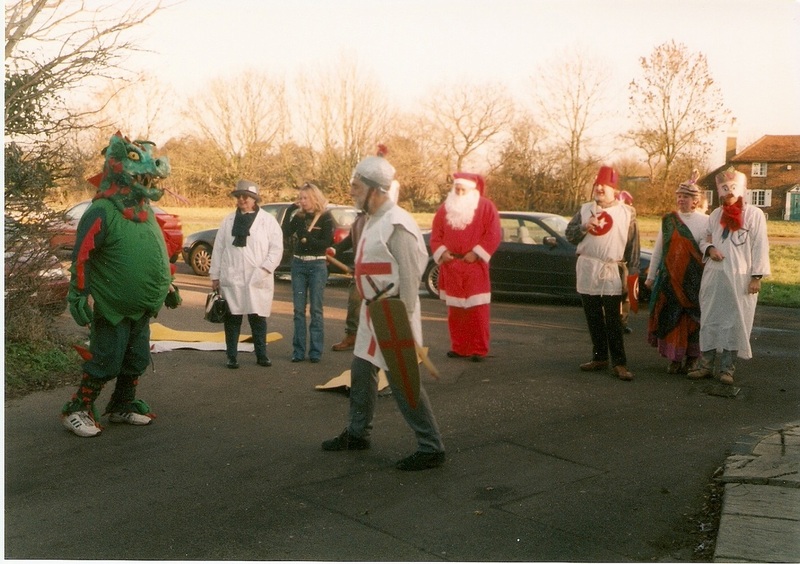 They raised money for local charitable works as well as for the school funds. 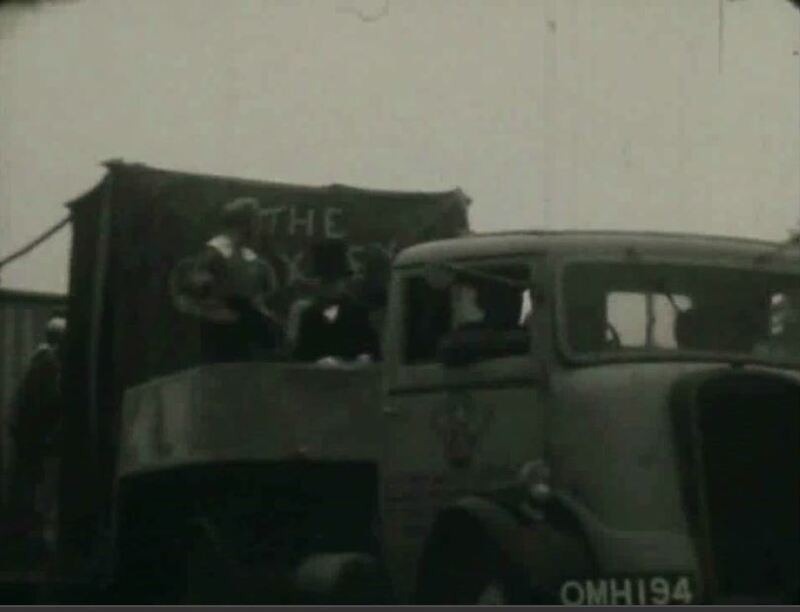 The local hospital received various sums and the school its first wireless (radio) set. 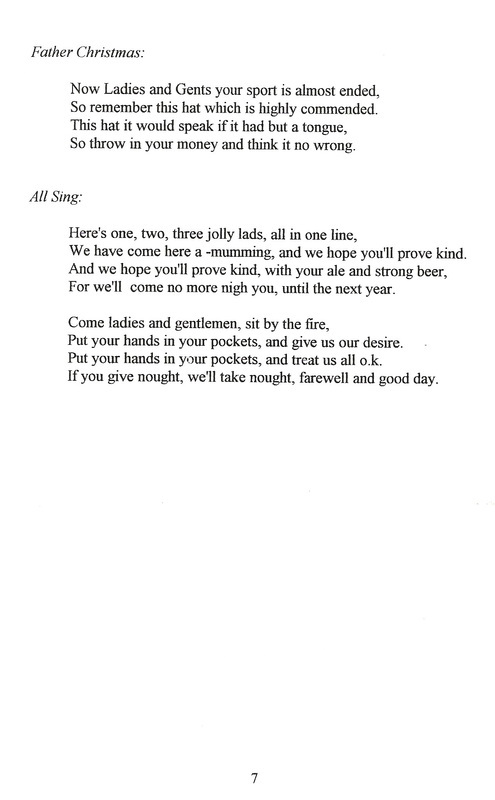 Some weeks ahead of the Christmas festivities, the young men were assigned or reallocated their parts and rehearsed in preparation for the big night. 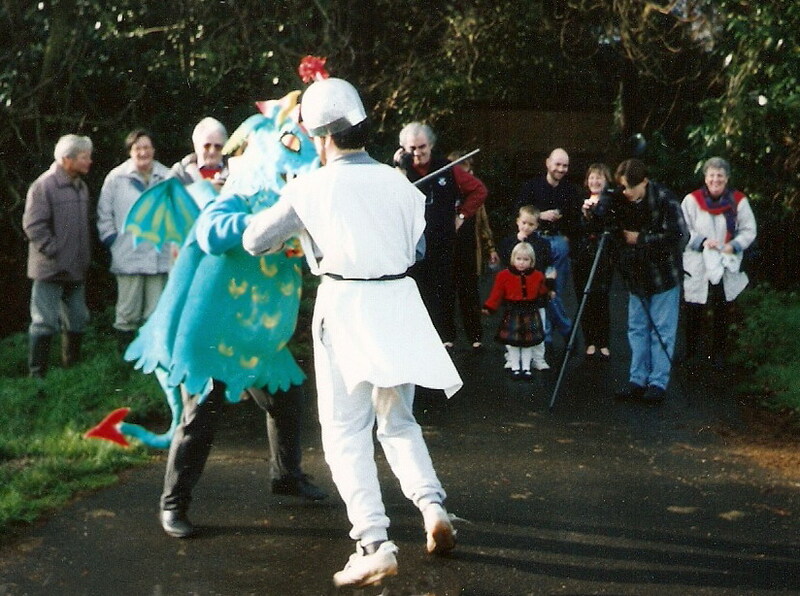 The costumes were home made but very elaborate and although of an amateur style the production was very entertaining. 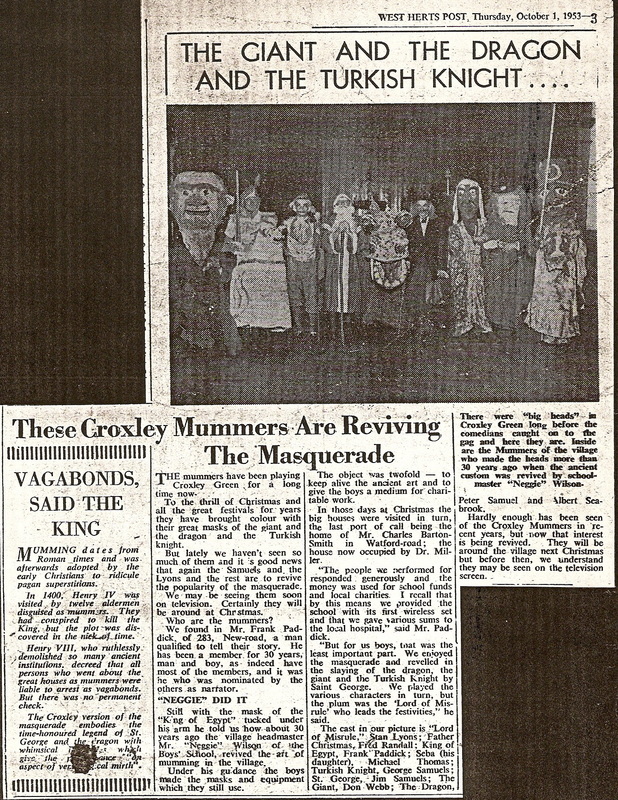 These masks and costumes, having been stored away under the stage of the theatre behind the Guildhall, were examined to make sure they were in good order before their Christmas performance. 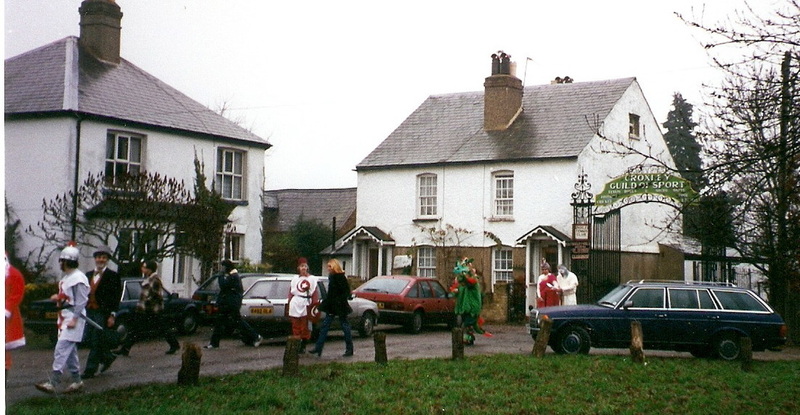 The families in the larger houses throughout the village would await the anticipated visiting Mummers and the order of performances was always exactly the same from year to year unless exceptional reasons prevailed. 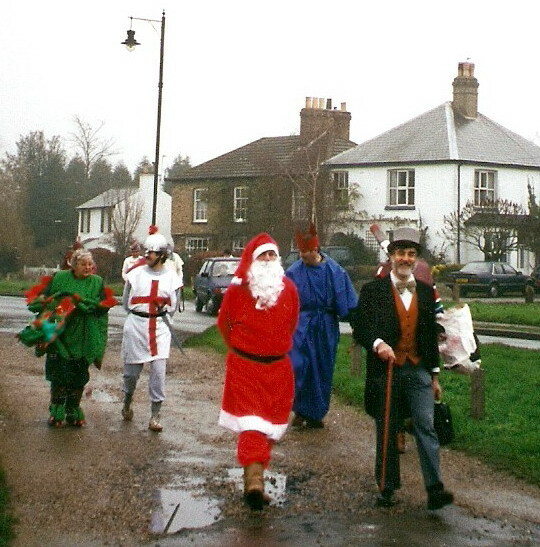 Eager and excited, the young men would assemble at the Old Boys School to dress in costumes for their first performance at the Vicarage for the Vicar, his wife and one or two maids, the smallest audience of the evening. 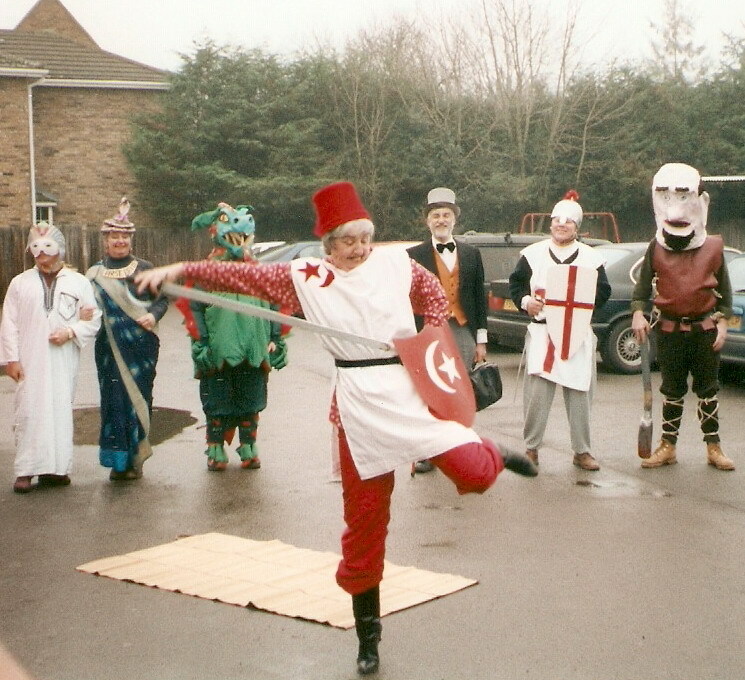 Awaiting the troupe and just as jubilant at ‘Elmcote’ on The Green, then the home of Mr. F B Adams, were the family, servants and guests who were probably aware of the approach of the Mummers as they heard them singing the Wassailing Song. 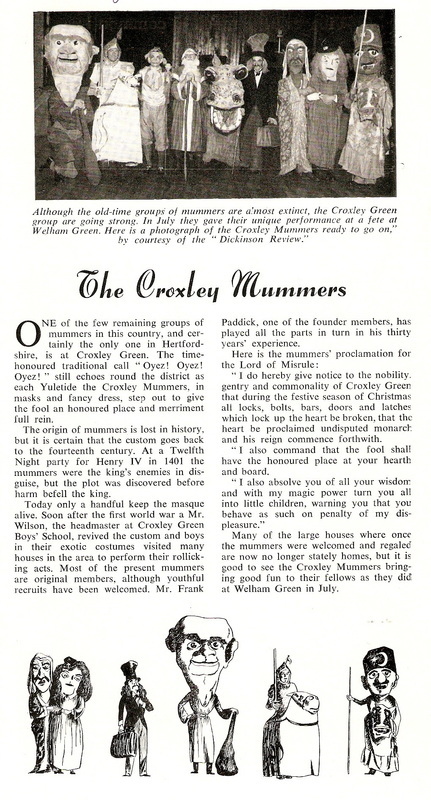 The performance over, the butler Mr. Graver handed round glasses of a welcome ‘comforting drink’ to send them on their way to the Casebourne family in Copthorne Road. 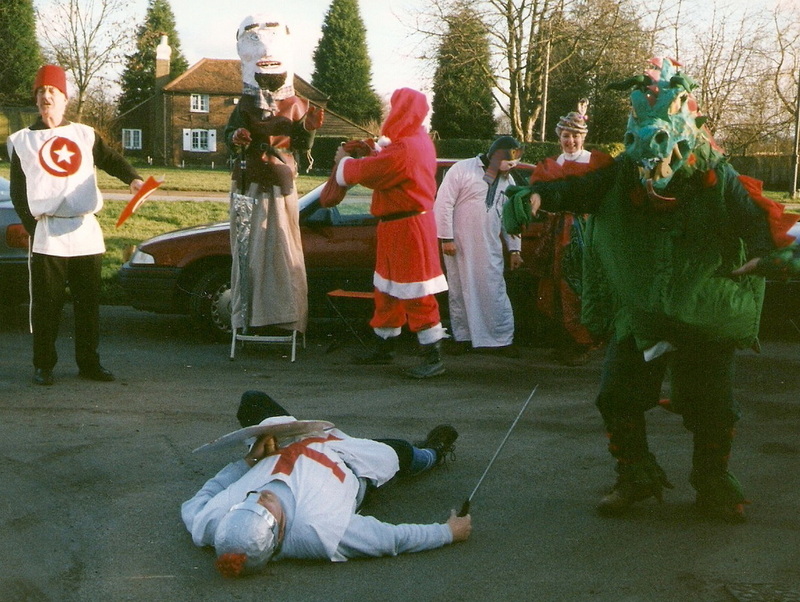 This time the players were greeted by an even larger party, described as the ‘Pickwickers of Dingley Dell’, with all those assembled kissing the Mummers in turn. 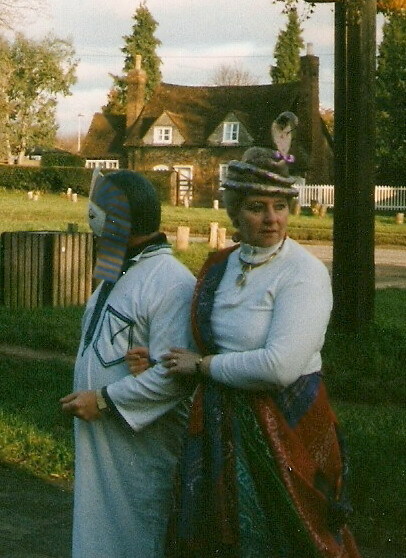 By now, with their timetable running late, they made a hurried walk across the road to Parrotts, receiving a short reminder on the virtues of punctuality. 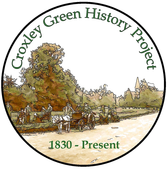 With several houses yet to visit and in the darkness of The Green they made their way to Little Green and Waterdell House where bright lights awaited them and the kind-hearted Mrs Forbes, who greeted them with a box of chocolates, inviting them to eat as many as they could manage. 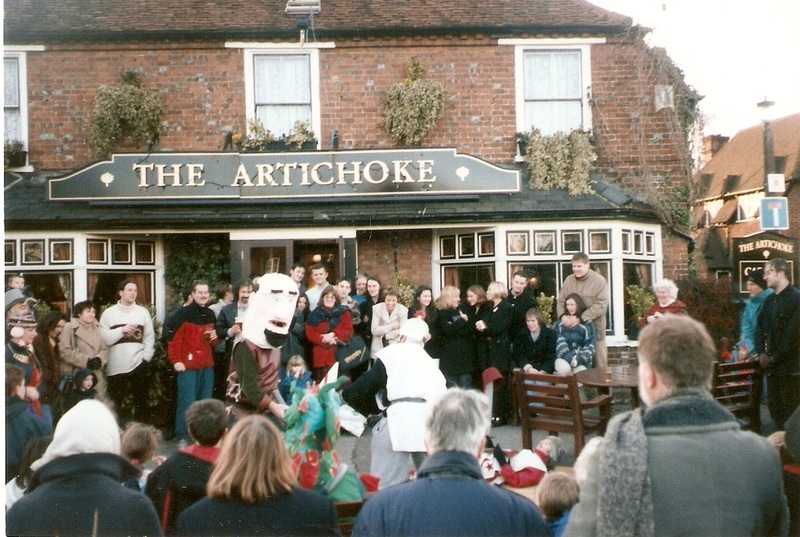 At The Firs, just off The Green, they performed yet again prior to the long walk to the Watford Road and Lindiswara, the home of Charles Barton-Smith, manager of John Dickinson paper mill, and their last performance. 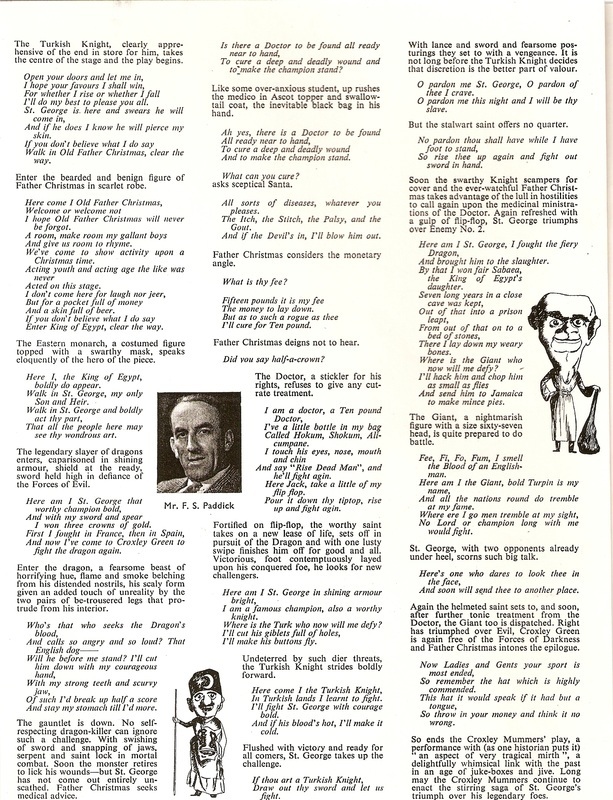 By this time close to midnight, tired and weary, their spirits were revived by his generous hospitality and invitation to make themselves at home and tuck into the substantial fare. 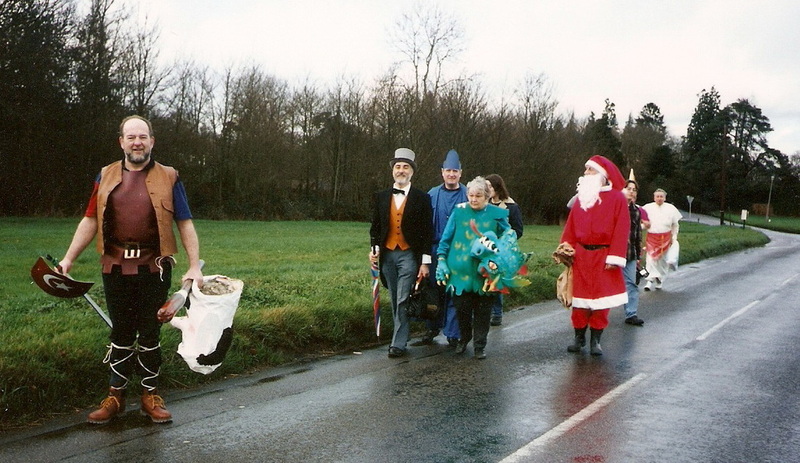 It was a band of happy players who finally and reluctantly on a cold Christmas morning made their way home through a deserted village. 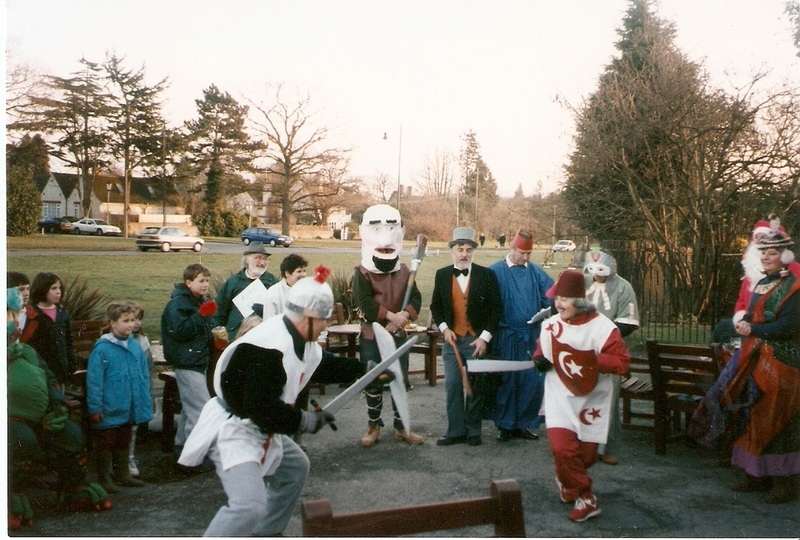 This tradition continued for many years, the venues and cast changing, until the mid 1930’s - about the time Neggy Wilson retired as headmaster and the shortly before the outbreak of World War Two. 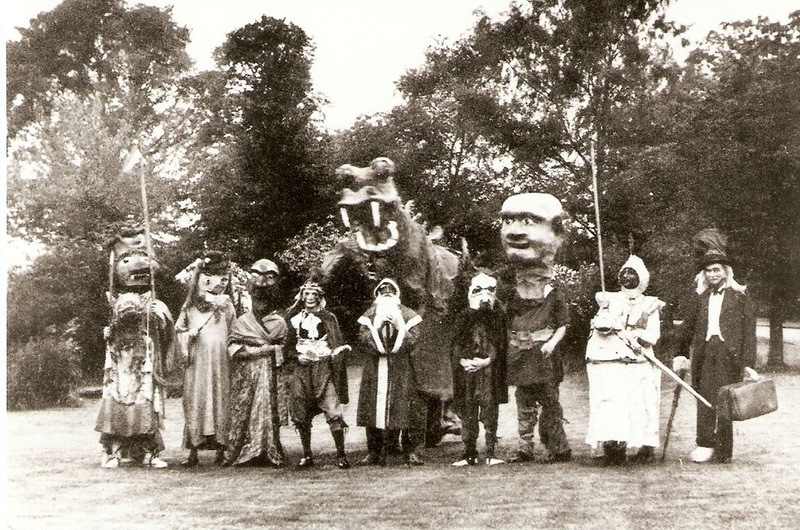 From time to time after the war they made appearances at the time of national events or special requested performances until the late 1950’s. 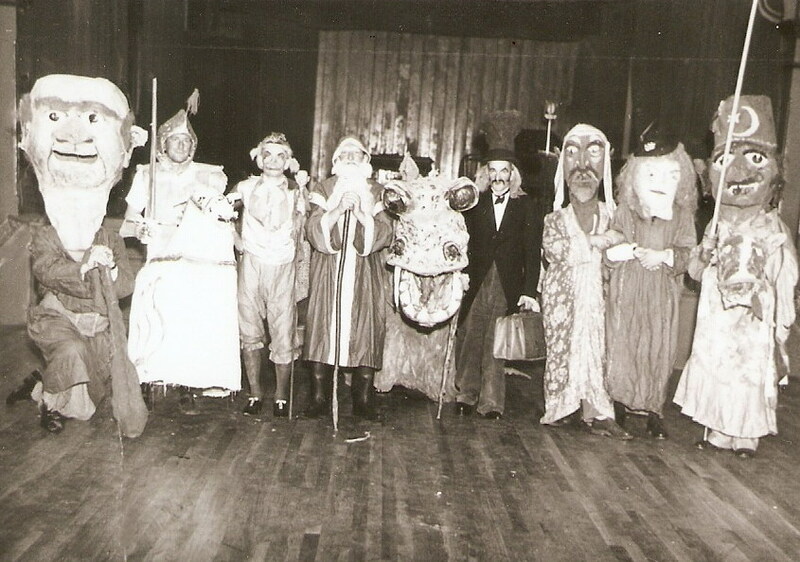 Sadly, many of the original costumes were lost when the hall behind the Guildhall was destroyed by fire in 1965. 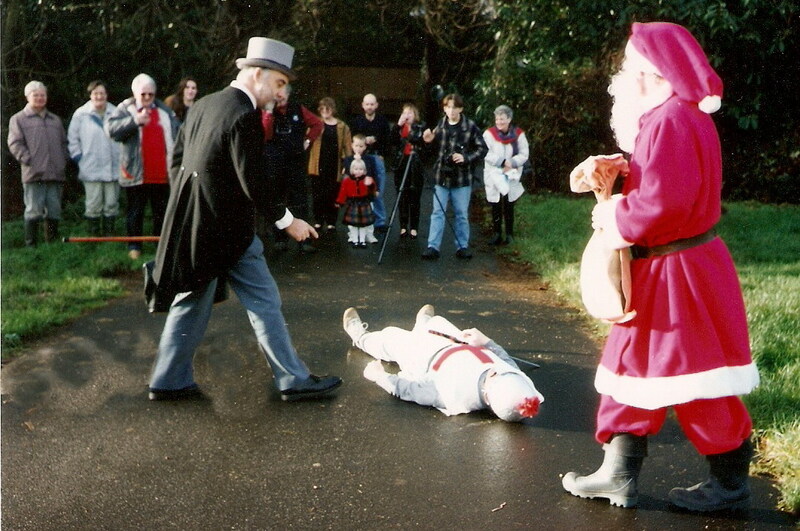 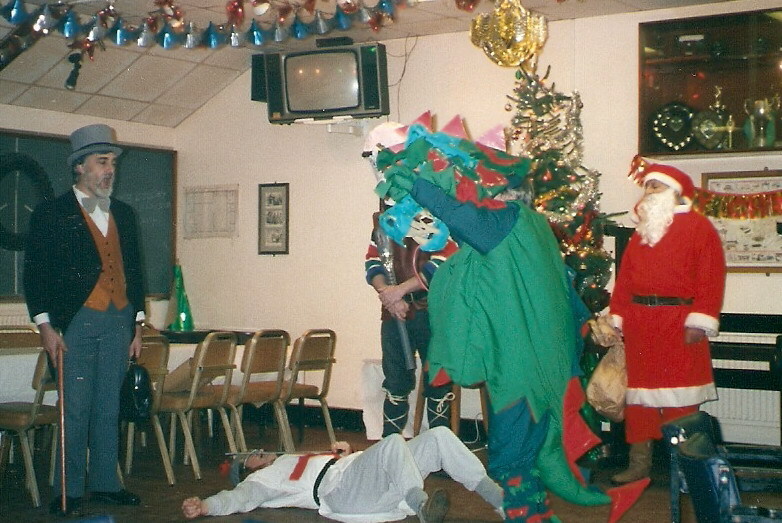 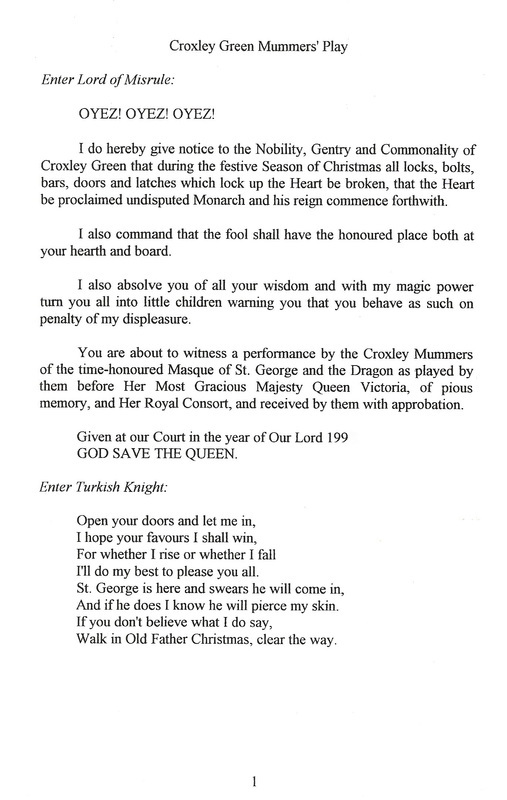 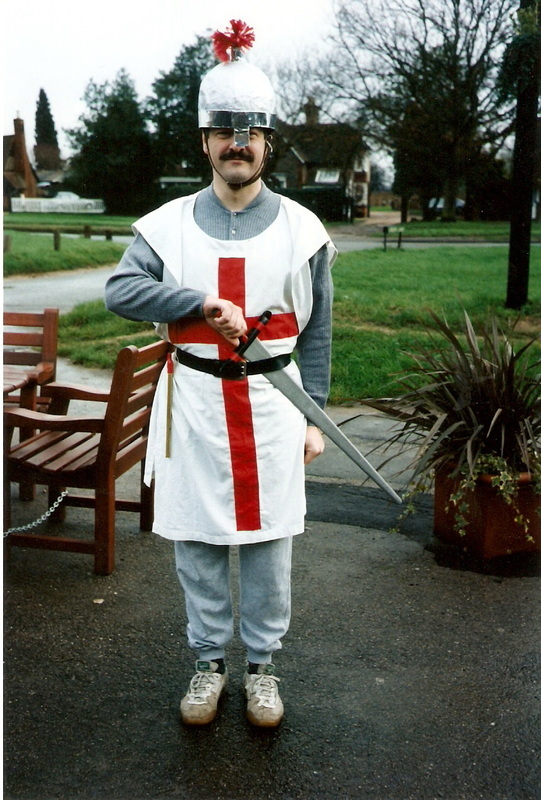 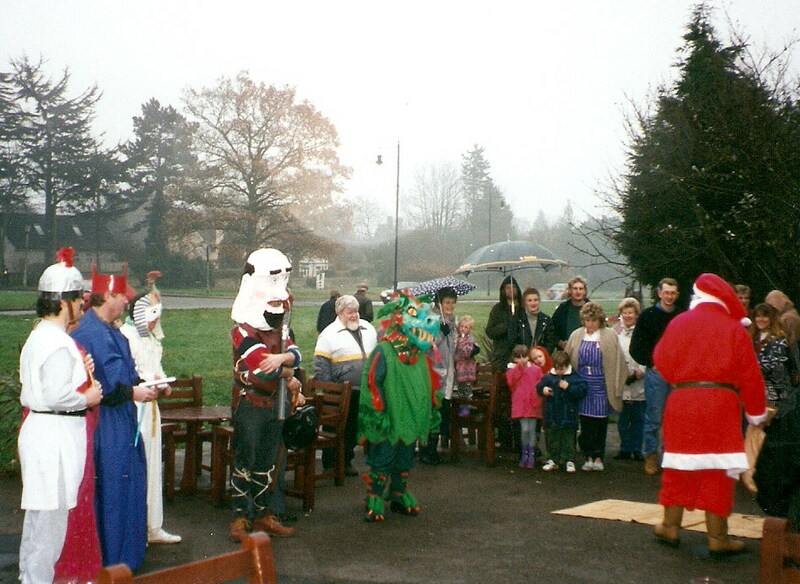 In 1994 a group of Croxley Green residents including family members of players who had taken part in the early versions, decided to try to revive the play and perform it at Christmas time. 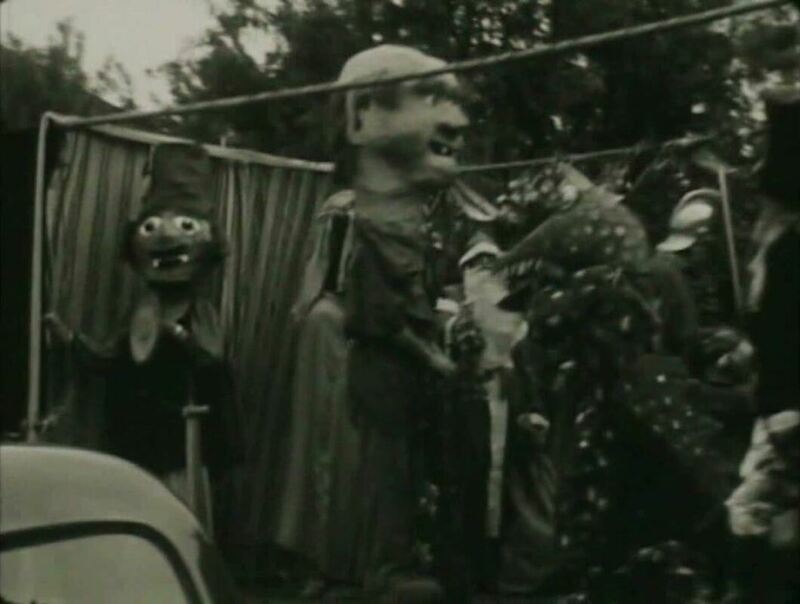 A copy of Neggy’s play was found, residents were recruited and asked to become ‘actors’ and they set about making costumes and rehearsing. 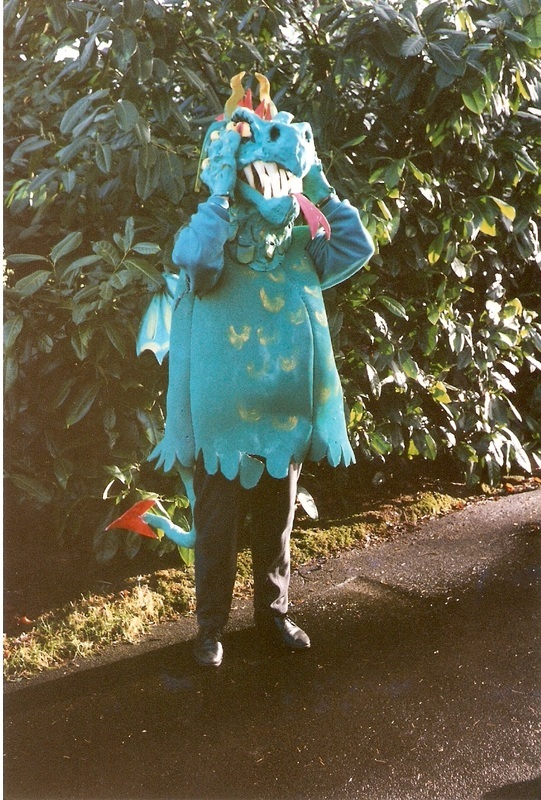 One member was actually a relative of Neggy’s original cast. 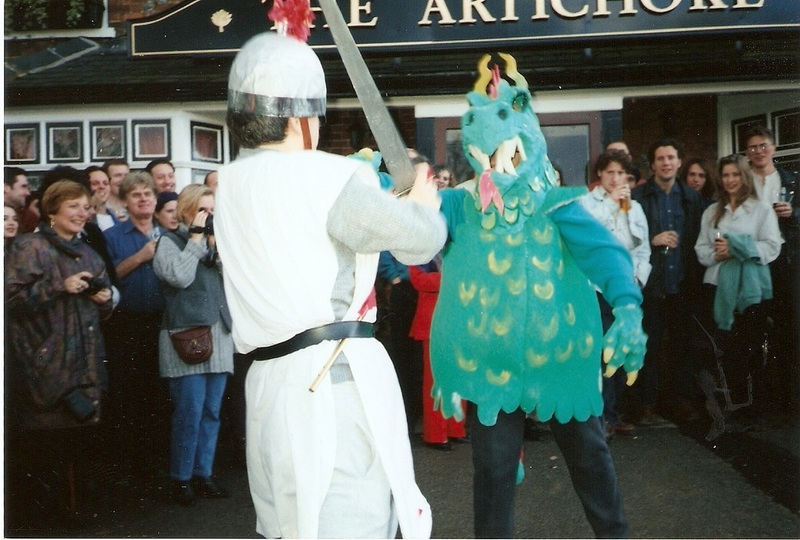 By chance another member’s daughter was associated with the costume department at the Royal Shakespeare Company at Stratford upon Avon and produced a lavish Dragon’s outfit for her mother. 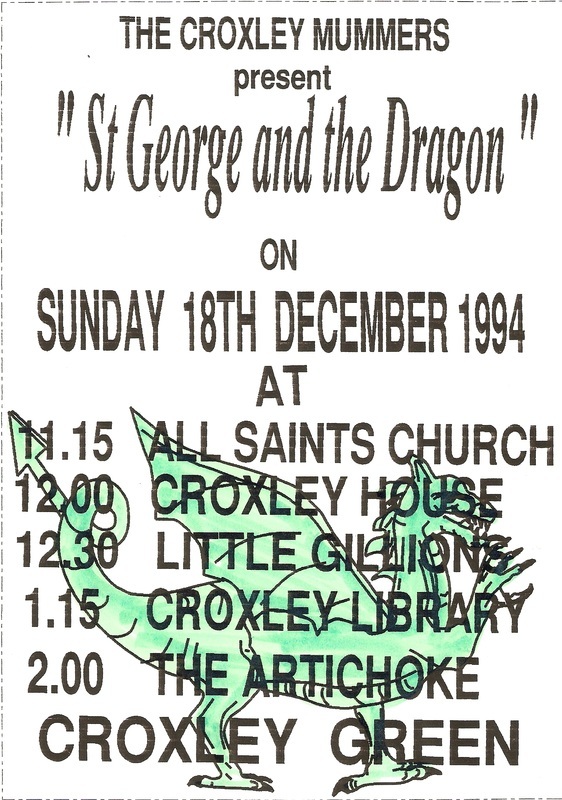 The first rehearsals were held in Yorke Mead School then later at the Scout HQ in the Watford Road as well as ‘The Shed’ behind The Sportsman public house. 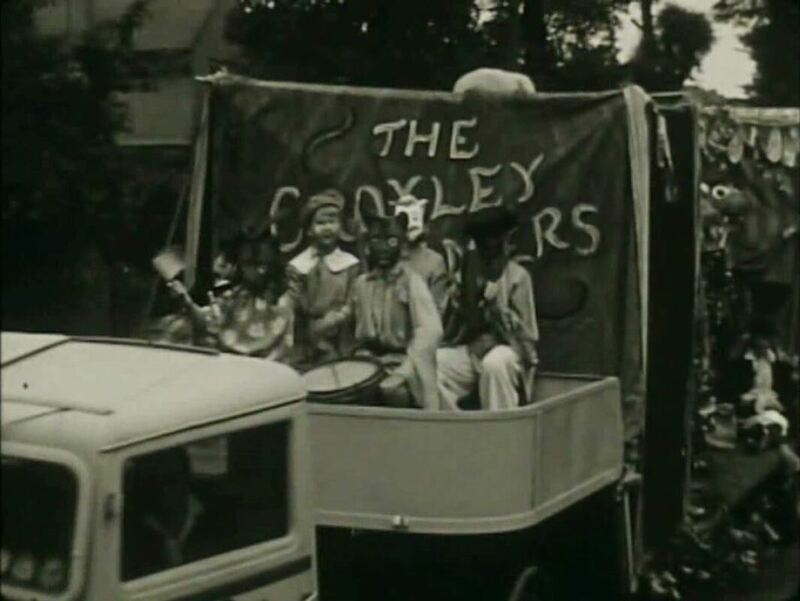 With the new troupe sufficiently rehearsed and a new set of venues agreed (the original ones being no longer available) suitable publicity was displayed. 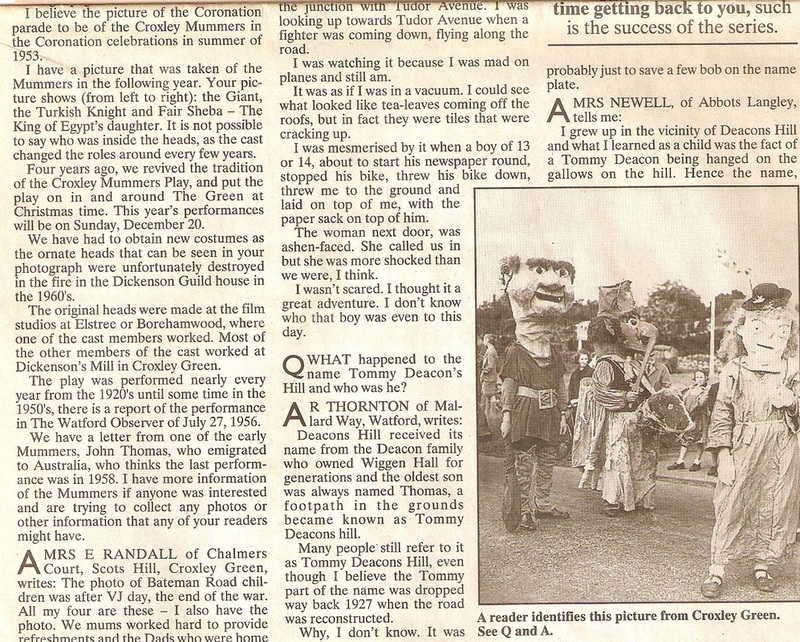 It came to the notice of an officer at the District Council (Three Rivers District Council) which caused a slight problem and notified the group that a ‘Theatre Licence’ was required plus various public safety regulations such as ‘first aid’ ‘toilet facilities’ ‘emergency exits’ amongst other official requirements otherwise a hefty fine could be imposed and even imprisonment if this was not duly paid! 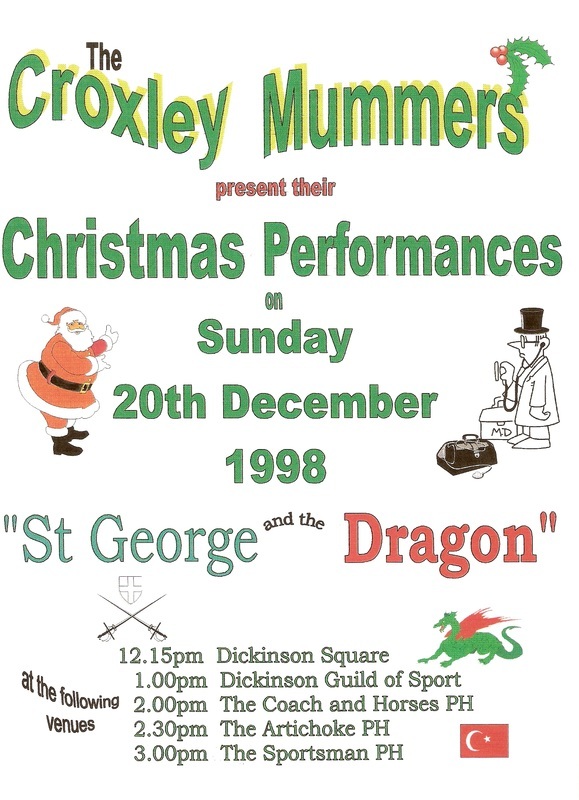 It would appear regulations had somewhat changed for performing even on an amateur basis. 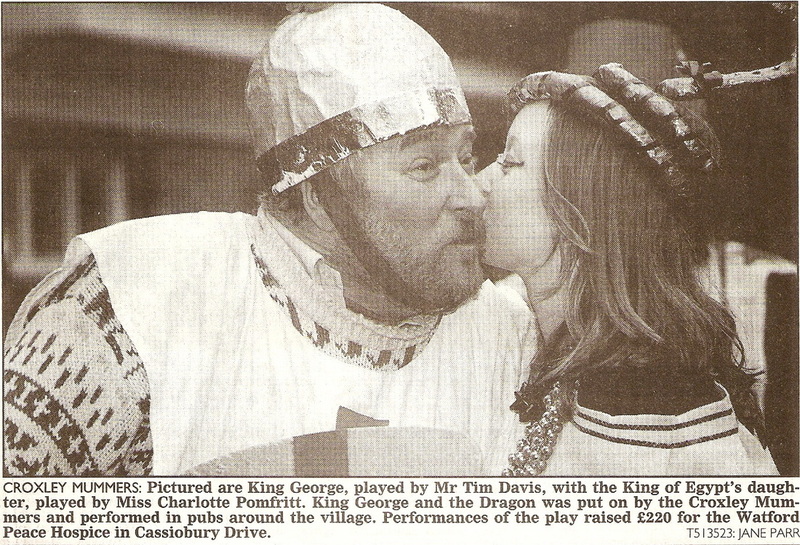 Publicity reached the local and national newspapers. 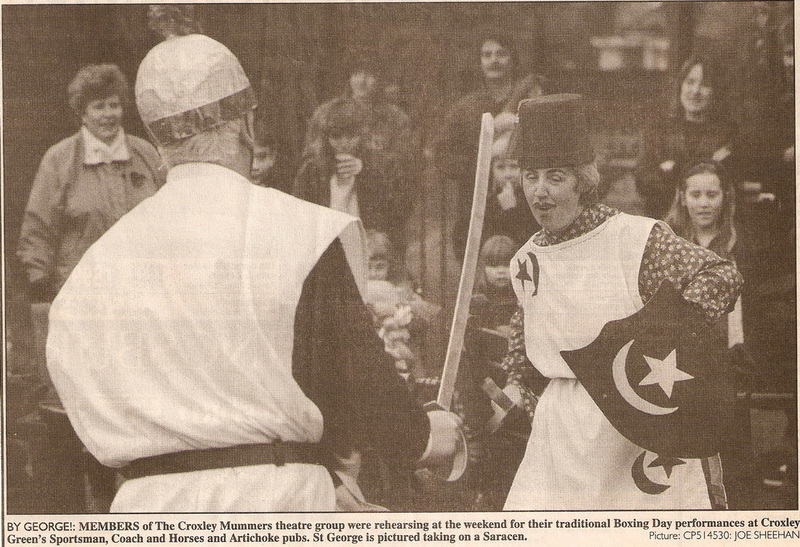 Eventually common sense prevailed – as it was an amateur historical ‘event’ once a year the fees would be overlooked. 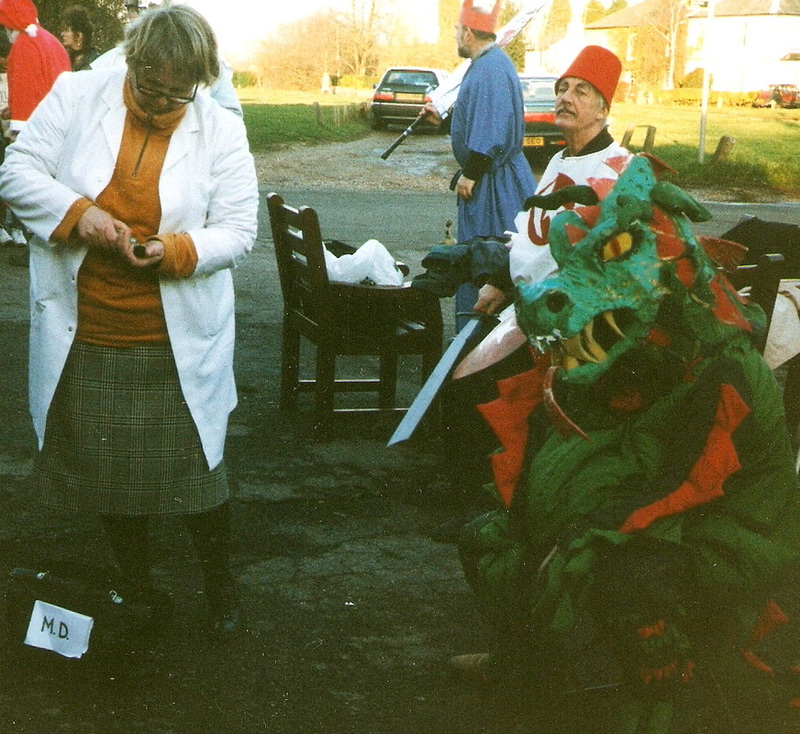 However, tongue in cheek and in good humour, the group responded with some essential equipment such as a ‘child’s potty’ and a travelling first aid kit! 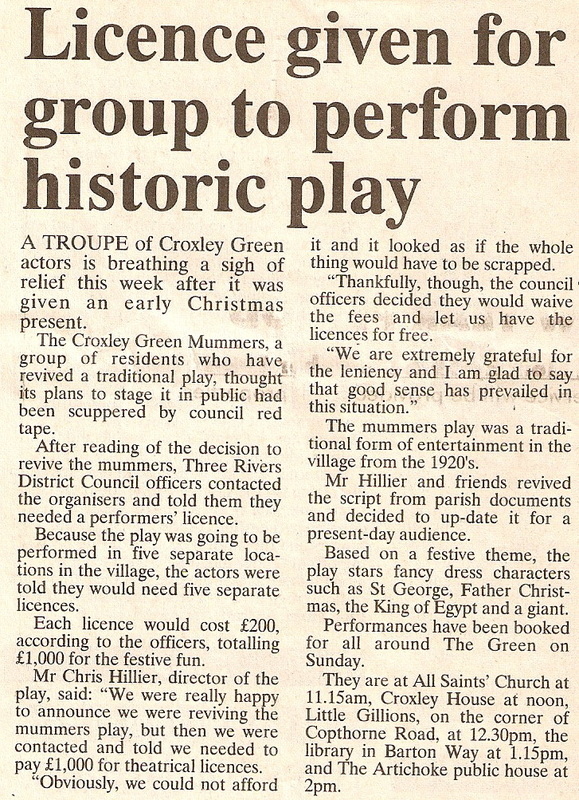 This Christmas is unlikely to produce a more nonsensical example of red tape by a Hertfordshire council to sabotage a charity fund raising effort by eight amateur actors from the village of Croxley Green. 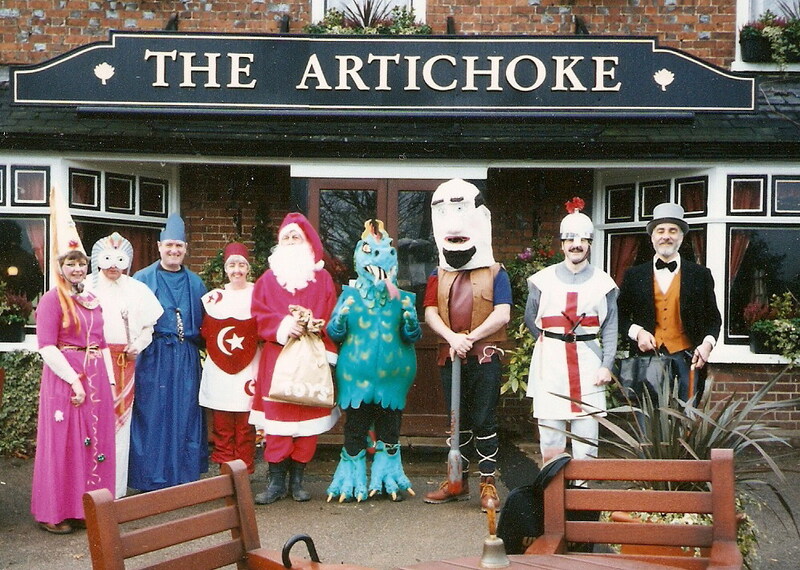 To raise funds for a Watford hospice, the group planned to revive an ancient local tradition by staging a traditional mummers play for lunchtime drinkers outside the village pubs on December 22nd. 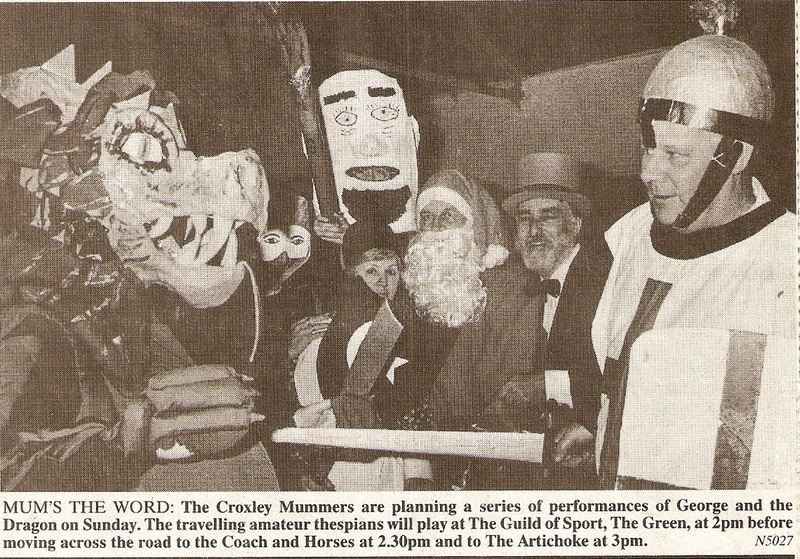 But the Three Rivers Council-motto “Investor in people “ - told the mummers that they would be committing a criminal offence under the 'Theatres Act, because their performances would take place before 2pm, and they would therefore risk heavy fines. 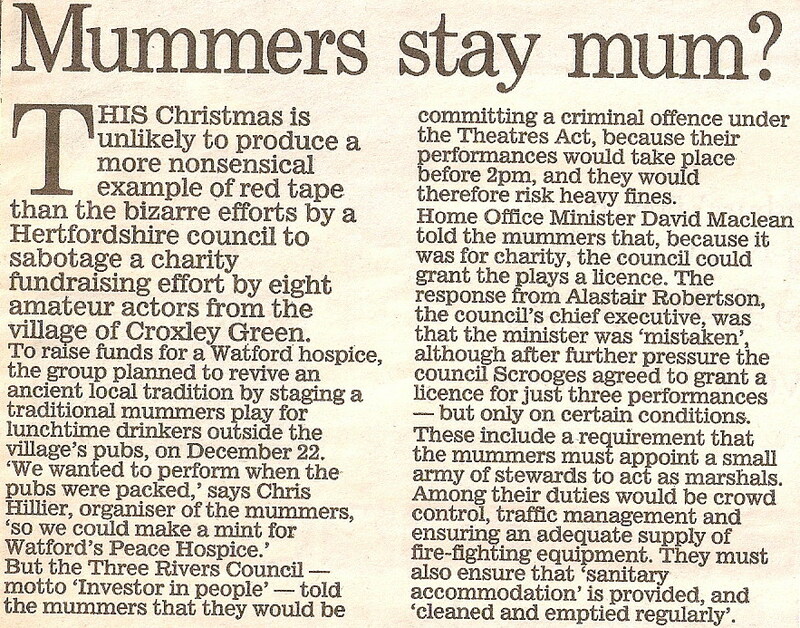 Home Office Minister David Maclean told the mummers that because it was for charity,the council could grant the plays a licence. 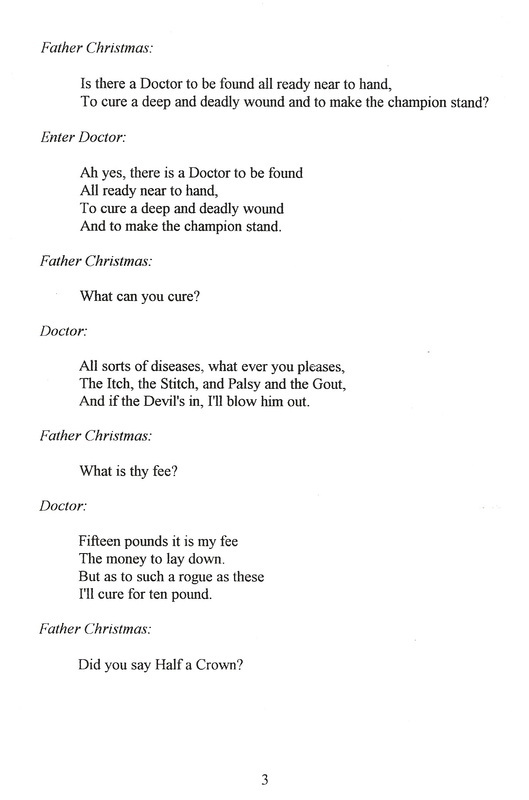 The response from Alistair Robertson,the council's chief executive, was that the minister was 'mistaken' although after further pressure the council Scrooges agreed to grant a licence for just three performances- but only on certain conditions. 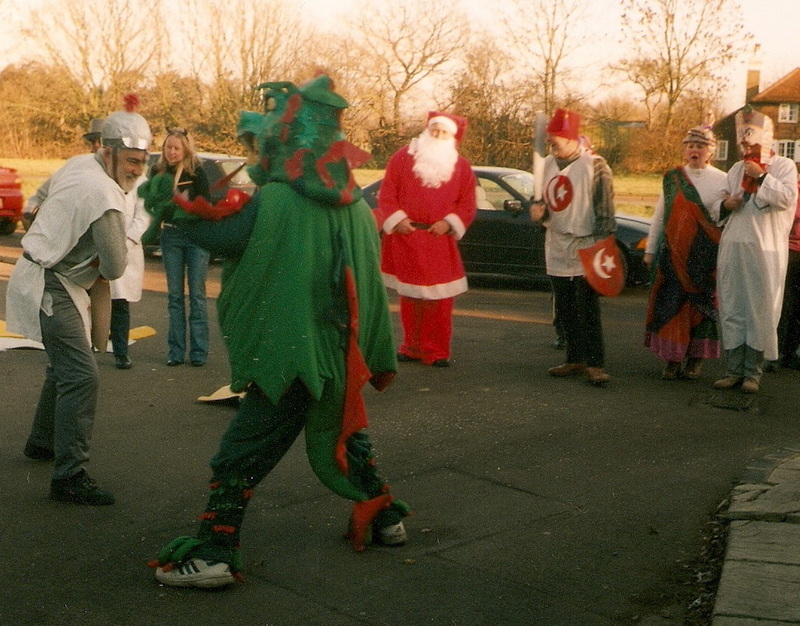 The performances usually took place on the Sunday before Christmas at various locations including Dickinson Square and the hostelries on The Green and Scots Hill. 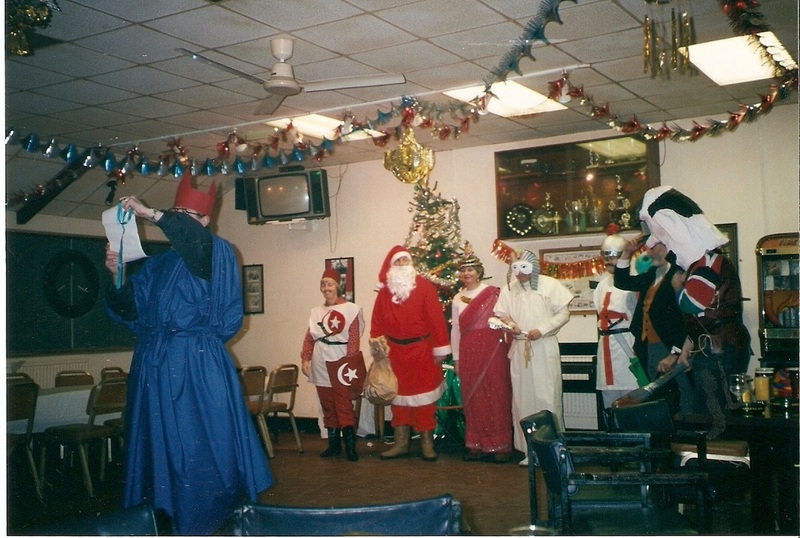 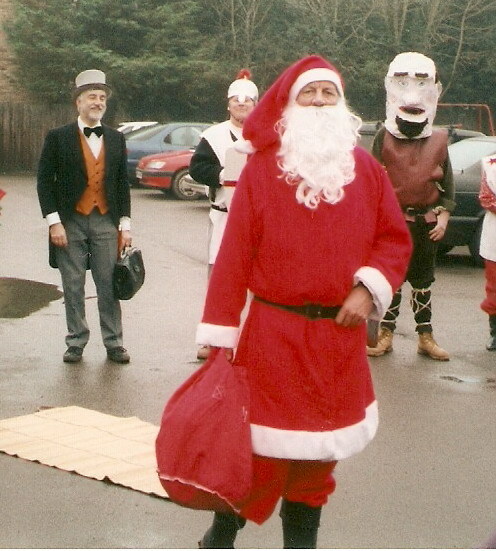 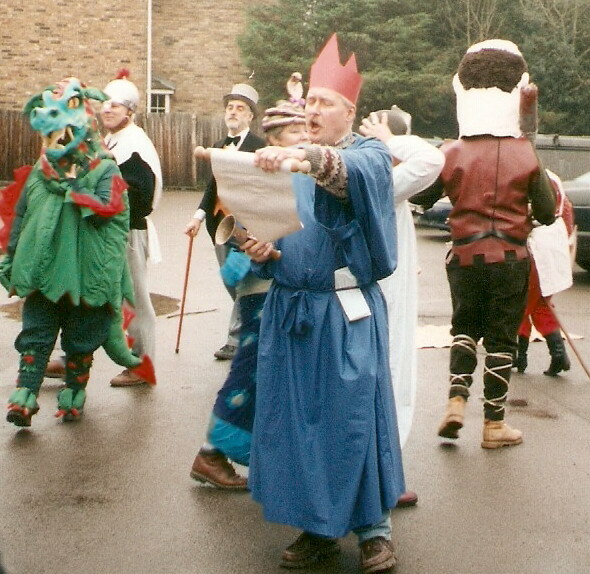 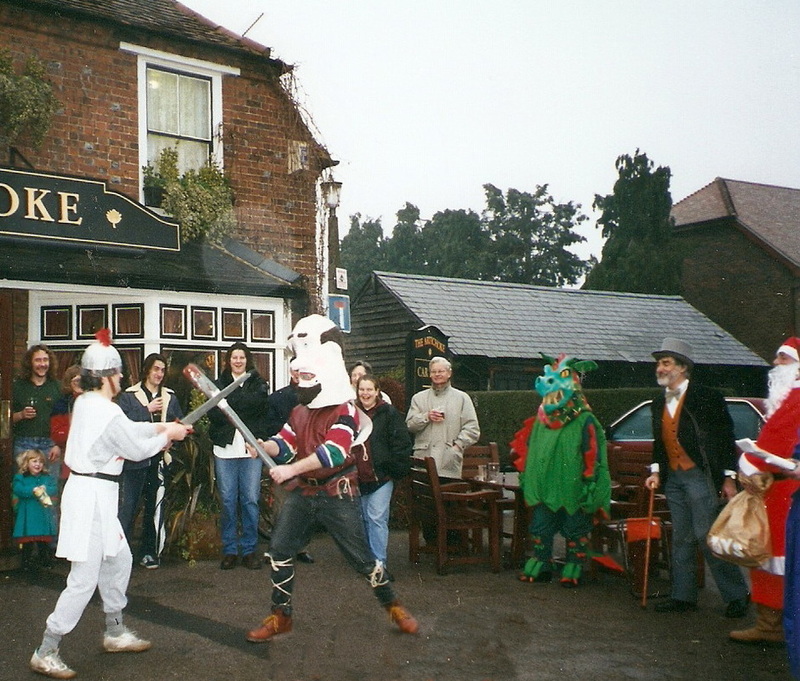 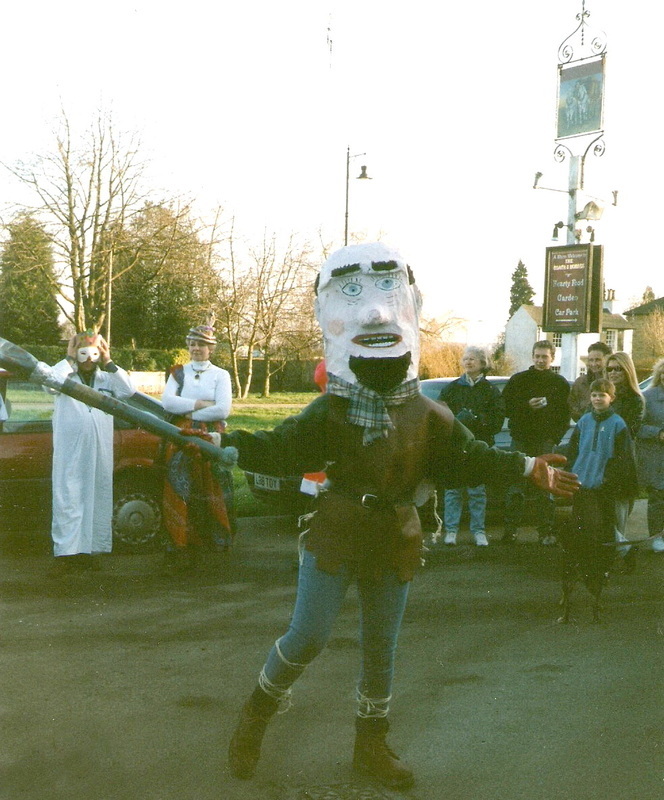 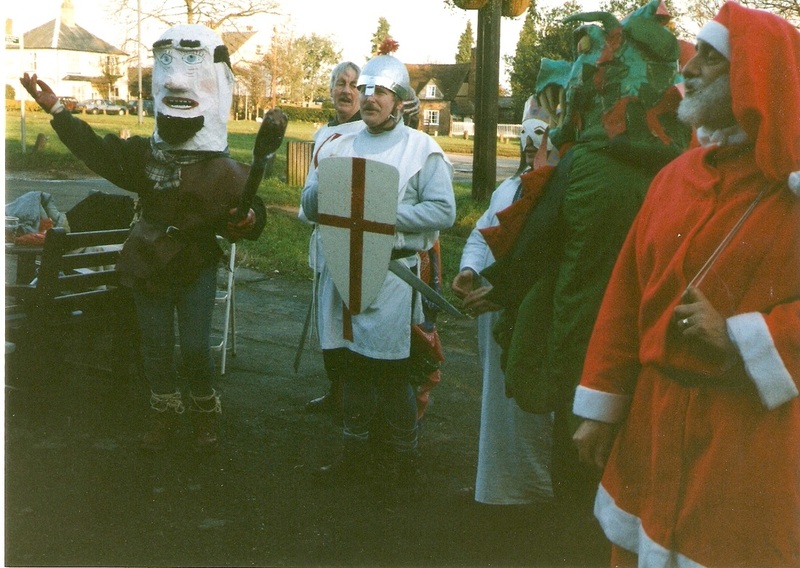 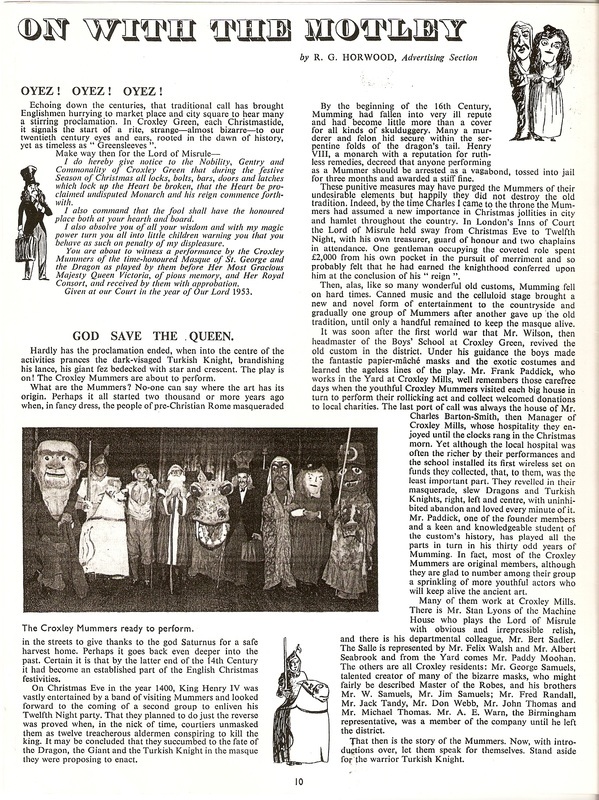 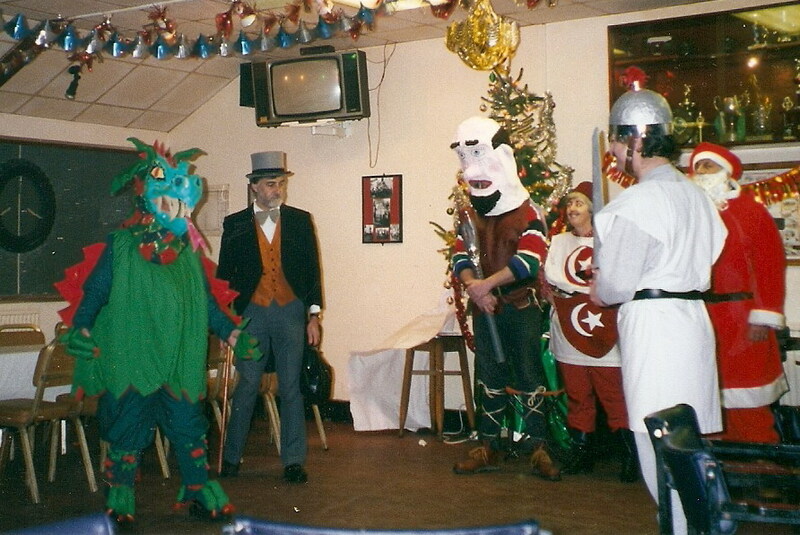 The group of residents who took part in the revival from 1994 for many years include in order of appearance The Lord of Misrule, Alan Monahan; St. George, Nigel Moorcroft; The Dragon, Madryn Walden; The Doctor, Chris Hillier; Father Christmas, George Paddick; Turkish Knight, Margaret Pomfret; The Giant, Dave Bennett; King of Egypt, John Quick; King of Egypt’s daughter Michele Bennett. 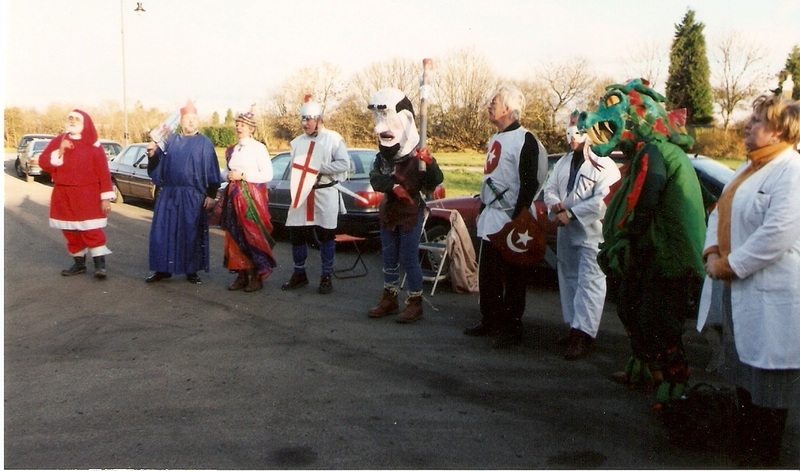 Other players who contributed in the early years to take on roles when players 'dropped out' included Bob and Hilary Parnell, Roger Catttermoul, Tim Davis, Graham Sawyer and Charlotte Pomfret. 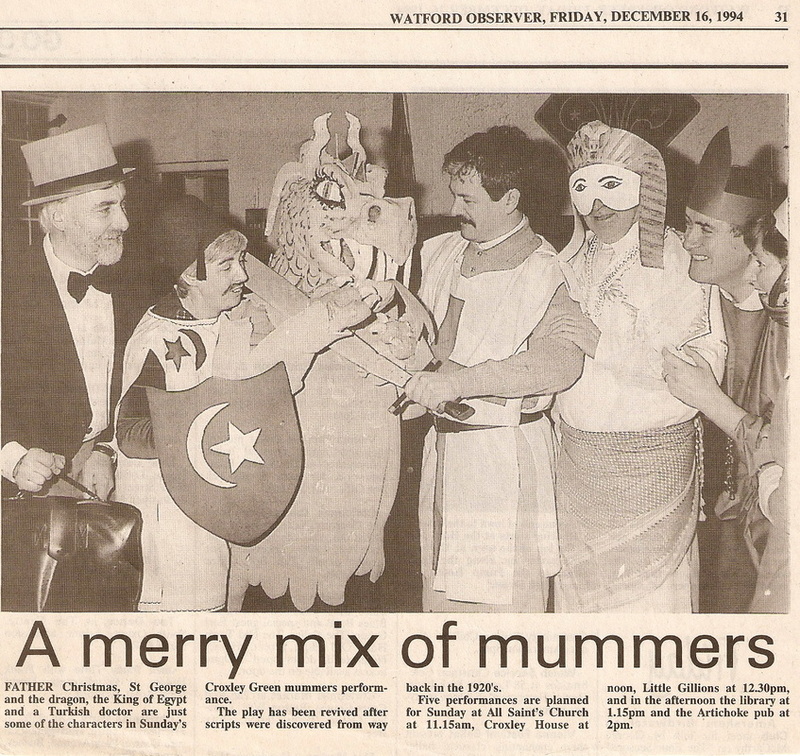 After many appearances over the years The Mummers have attracted many loyal supporters that generously donate money for the children’s hospice in Watford. 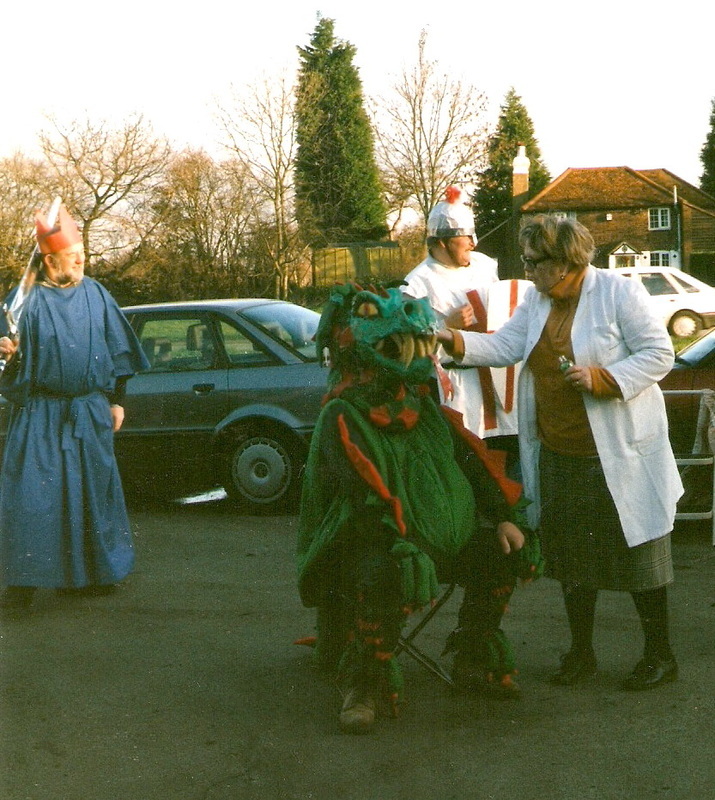 The children's Peace Hospice continues to benefits from the generous donations from every performance. 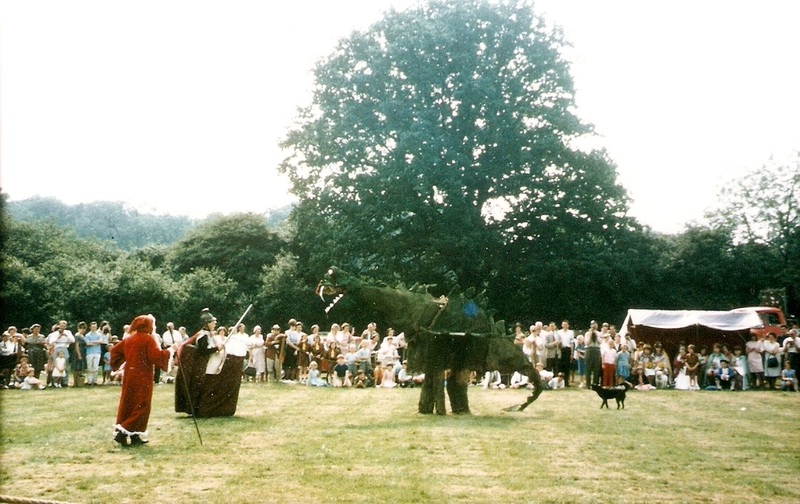 © Margaret Pomfret as The Giant!